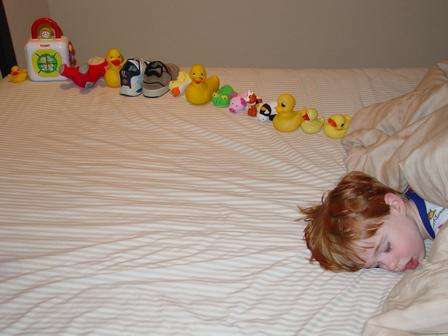 Quinn, an autistic boy, and the line of toys he made before falling asleep. Repeatedly stacking or lining up objects is a behavior commonly associated with autism. Credit: Wikipedia. (Medical Xpress)—Studying children with autism and their parents, researchers have found that when a child has autism, his or her parents are more likely to have autistic traits than parents who don't have a child with an autism spectrum disorder, as measured by a survey used to identify such characteristics. Past studies have found that the siblings of children with autism also tended to have more autistic traits than the siblings of kids without autism. But this study is the first to connect significant numbers of autistic traits in parents to diagnoses of autism in their children. The research—from investigators at Washington University School of Medicine in St. Louis, the Harvard School of Public Health and the University of California, Davis—is available online in the journal JAMA Psychiatry. "When there was a child with autism in the family, both parents more often scored in the top 20 percent of the adult population on a survey we use to measure the presence of autistic traits," said one of the lead researchers, John N. Constantino, MD, the Blanche F. Ittleson Professor of Psychiatry and Pediatrics. "It could be that a mother or a father is just a little bit repetitive or slightly overfocused on details," Constantino explained. "We can measure the presence of those traits with our questionnaire, but higher scores don't mean a parent has problems. In fact, there may be advantages to having some of those traits. The problem comes when those traits are so intense that they begin to impair a person's ability to function." Just as an adequate amount of mashed potatoes and gravy won't take over a dinner plate—but too much may end up spilling over into everything else on the plate—with autistic traits, too large a "helping" of particular traits can have a negative influence on a child's behavior and social skills. Constantino, director of the William Greenleaf Eliot Division of Child and Adolescent Psychiatry at Washington University and psychiatrist-in-chief at St. Louis Children's Hospital, said the traits related to autism tend to be natural variations in social skills. The researchers analyzed data from 256 children with diagnoses of autism and almost 1,400 children who did not have the disorder. Data from more than 1,200 mothers and 1,600 fathers of the children also were included in the analysis. All of the subjects were part of the Nurses' Health Study II, which has been gathering health information from more than 116,000 nurses since 1989. Kristen Lyall, ScD, and her colleagues at the Harvard School of Public Health used the Social Responsiveness Scale (SRS) to measure the presence of autistic traits. The SRS is a tool that was developed by Constantino. People who score less than 59 on the SRS are considered normal and healthy. When both parents had mild elevations in SRS scores, the study indicated that they were 85 percent more likely than parents without elevated scores to have a child with an autism spectrum disorder. If only one parent's SRS score was high, the likelihood of having a child with autism spectrum disorder increased by 53 percent. And even among children without autism diagnoses, elevated parent scores correlated with higher SRS scores in their children. It might seem uncommon that couples with high levels of autistic traits would get together and have children, but when one parent scores high for autistic traits, it's likely the other parent will, too. "It turns out that people tend to select one another on the basis of many of the same traits that the SRS measures," Constantino said. "Likes attract. If one person has a high score, he or she is more likely to partner with another person who also scores high." That's likely to raise the chances that their offspring will have elevated scores. "When both parents have scores at or above the top 20 percent, the child's score is 20 to 30 points higher than when neither parent has an elevated SRS score," he explained. To better understand how the genetic risks for autism are transmitted from parents to children—and what might protect some individuals in a family from experiencing clinical impairment even when they inherit the same risk factors—Constantino and his colleagues are conducting studies involving molecular, neuroimaging and behavioral methods to trace autism susceptibility across generations in families. I have been saying this for years from observing parents with kids that are autistic and all I have ever gotten was attacks by those parents that do not want to look in the mirror and admit that they are the reason that their kids are autistic. In every autistic child I have been around either one or both parents have some autistic traits, usually not as pronounced but they are there none the less, glad someone finally studied it and identified the link instead of allowing these parents to attack vaccines and everything else under the sun to try to show that their kids are autistic and in reality it is their genes that caused it. Vaccines are the fault that so many kids have autism, no the fault of the parents. Parents spend their lives making good the damage the pharmaceutical companies and the governments and people like the above who probably is on every other forum about autism defending the filth that's stabbed into newborn babies for profit. The person about might even be getting paid to stick his or her nose into these forms by the companies. I've five kids and every one of them are like me in one way or the other, their from my loins, why wouldn't they have my traits. The above must think everyone else is either thick stupid to believe the rubbish in his paid for words or maybe his parents must have been Neanderthals , and he or she picked up their traits. Getting a buzz from studying Autistic kids, man that's sick. There is not, & never has been any credible evidence linking any vaccine to autism. Anyone who has studied the condition or the scientific research on the subject knows that - it is those who choose to blame vaccines that are at best naive and ignorant, at worst stupid. As the parent of an autistic boy I can identify significant autistic traits in both myself and (less so) in my husband. I also have a neurotypical child. Both my children are fully vaccinated - to not protect your child from potentially life threatening disease is irresponsible. I am not being paid for my views by anyone and I don't know anyone who works for a pharm co. I don't see the news in this article, of course genetics play a role in autism, there have been many articles published the last few decades, even pointing out the specific genes. The expression of these genes though, is influenced by environmental factors, like nutrition and other compounds influencing the human metabolism, and with that, neurobiology. Until today there is no scientific proof of a connection between vaccines and autism, though one could wonder if governments would admit to have had their citizens injected with a harmful substance. Researchers are dependent on the data supplied by governments, so we probably never will know the truth.